PennsylvAsia: Pittsburgh Post-Gazette's "Stretched Thin" profile on Everyday Noodles and the challenging quest of finding, and training, qualified noodle-pullers. Pittsburgh Post-Gazette's "Stretched Thin" profile on Everyday Noodles and the challenging quest of finding, and training, qualified noodle-pullers. 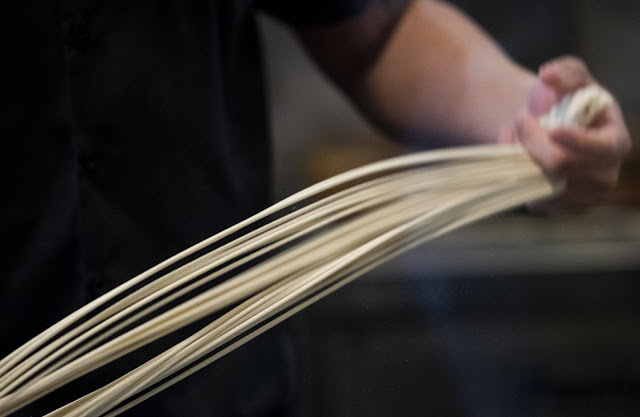 Melissa McCart of the Pittsburgh Post-Gazette has a profile on Mike Chen and Everyday Noodles, and the challenges that US immigration policy has posed to finding and keeping qualified noodle-pullers. Hiring international workers with H-1B visas solved Mr. Chen’s problem at first. He now has new problems that are affecting his ability to hire cooks. The Trump administration overhauled immigration policies, tightening eligibility. The changes are being carried out by U.S. Citizenship and Immigration Services (USCIS). In April, USCIS announced it reached the congressionally mandated 85,000 H-1B visa cap for fiscal year 2019, according to the agency website. The cap was met within five days — with over 190,000 applications received, less than past years, according to USCIS — which activated a lottery system. Specialized restaurant work generally no longer qualifies for an H-1B visa.